The indicator comes on to alert you that the passenger’s front airbag has been turned off. This occurs when the weight sensors detect 65 lbs (29 kg) or less, the weight of an infant or small child, on the seat. Infants and small children should always ride properly restrained in a back seat. Objects placed on the seat can also cause the indicator to come on. 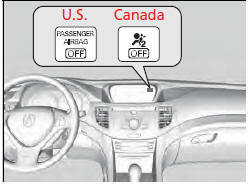 If the front passenger seat is empty, the passenger’s front airbag will not deploy and the indicator will not come on. • An object hanging on the seat or in the seat-back pocket. • A child seat or other object pressing against the rear of the seat-back. • A rear passenger pushing or pulling on the back of the front passenger’s seat. • The front seat or seat-back is forced back against an object on the seat or floor behind it. • An object placed under the front passenger’s seat. If none of these conditions exist, have your vehicle checked by a dealer as soon as possible. The passenger airbag off indicator may come on and goes off repeatedly if the total weight on the seat is near the airbag cutoff threshold.